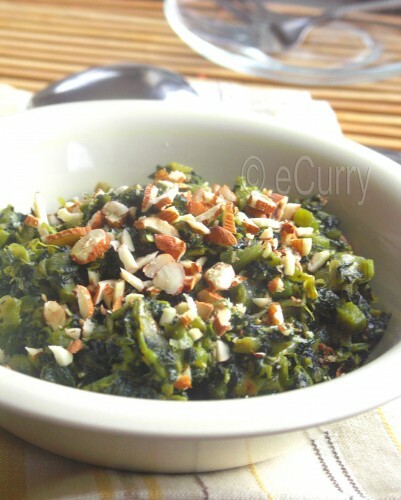 The Shak/Shaag (any leafy green) Bhaja (Stir fried or deep fried) is a big part of the Bengali/East Indian Cuisine. Back home, if I was having a typical Bengali meal, I do not recollect a single day that went without some kind of leafy green, & unlike many kids I would love every preparation of the Shak. 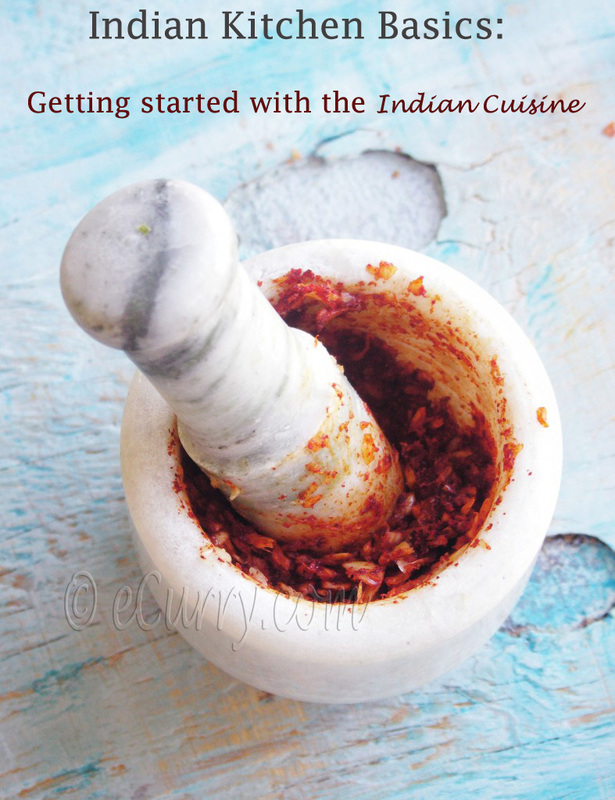 The starting course is a bitter; the recipe & the ingredients changes with the season but common ones are bitter gourd, or tender neem leaves (usually fried with eggplants). 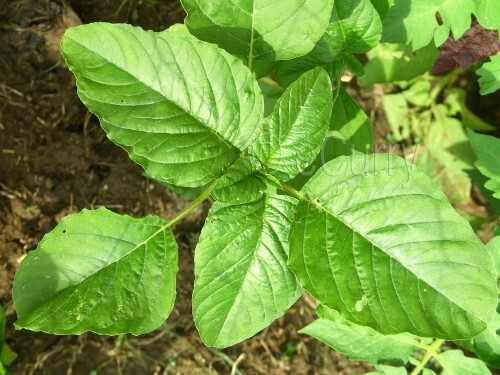 This is followed by shaak (leafy vegetables) such as spinach, pui, fenugreek, or amaranth. 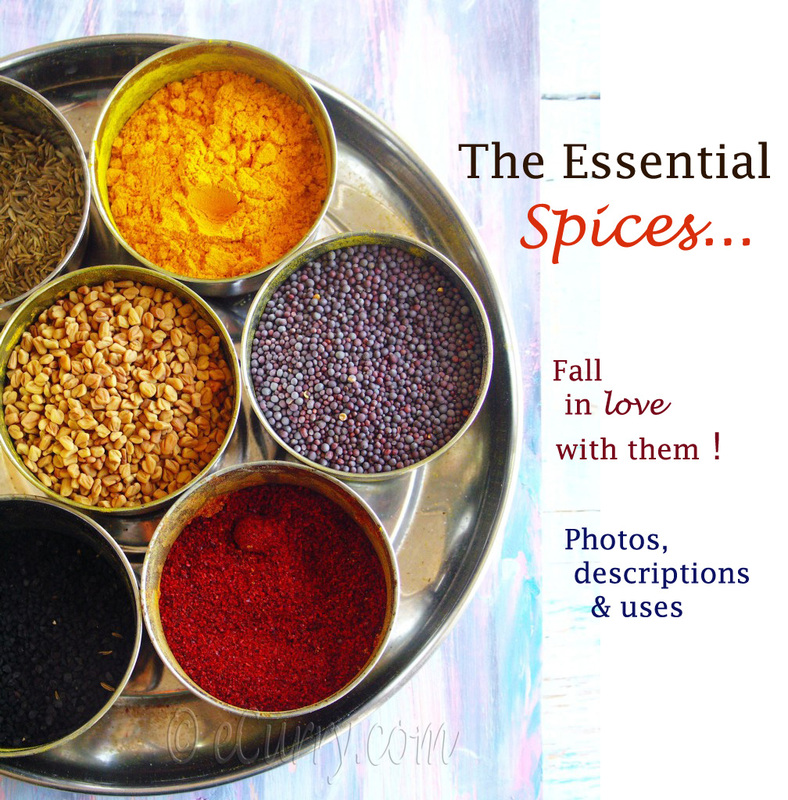 Next come the dal/lentil, which is usually accompanied “something” Bhaja (fried – most of the times deep fried); that something could be any vegetable, but the usual ones are potatoes, eggplants or pumpkin Fried fresh water fish is a great candidate too. Another accompaniment with the dal/lentil is a vegetable preparation usually made of multiple vegetables cooked together; this could be either one of – Labra, Chorchori, Ghonto, or Chanchra. The next course is the fish/shrimp course, which might or might not be followed with a meat course. Finally comes the chutney course, which is typically tangy and sweet; the chutney is usually made of mangoes, tomatoes, pineapple, tamarind, raw papaya, or just a combination of fruits and dry fruits. 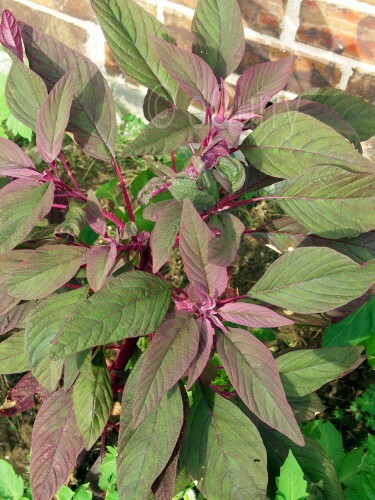 Largely found in India, Phillipines (& other South Asian Coutries), Mexico, Carribean, Africa, Greece & other warmer places, Amaranth is herbaceous plant of the genus Amaranthus.The tender edible leaves and stems, are rich in vitamins A and C, protein, folic acid, calcium and iron, and are often times cooked like spinach. The amaranth leaves are also a very good source of dietary fiber, Riboflavin, Vitamin B6, Magnesium, Phosphorus, Potassium, Zinc, Copper and Manganese. Amaranth is generally available as a red or green variety, sometimes the leaves have both colors. (More pictures). I have the Red Amaranth & the Round Leaf Green growing in my backyard. This happens to be my first harvest of the leafs from my back yard & I have used the Green Leaves for this recipe. The red ones are cooked in the same way, but the color is reddish/brownish when cooked. Note: The amount will reduce to about 1/4 of the original fresh green amount. Add the red dry chillies & the garlic; when the garlic starts to brown add the onions & fry till they look clear. Add the chopped greens, green chilli , turmeric & the salt; sauté for 2-3 minutes till the ingredients mix well. Cover the pan and turn down the heat to the lowest point & let it be cooked till it is done & the water is absorbed; dry the excess water while stirring & tossing quickly. Garnish with nuts. Serve with steamed rice. This is send to the Swiss Chard Challenge hosted at Daily Musings. 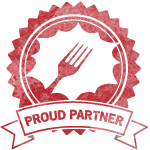 August 4th, 2009 | Category: Dry Fries, Sides & etc. That’s a nice pic, it looks tasty… I never had amaranth before. I loved hearing about the multi-course meal, so sumptuous while being homely! I would clean up a plate if there was any one of the starters you mentioned! Gosh they sound awesome Soma. And nice rich leaves on the little plant. I love the stir fry mixed with rice and ghee! Looks nice,love the snaps of amaranth leaves too! Soma, I am preparing a post on Amaranth and I was just about to go and make the recipe! I grew up with amaranth but I had not seen it in the states until last month at a farmer’s market. I got excited when I saw your post on it! We also stir fry it or saute it. Thanks for sharing! Hi! The plant looks really healthy. I like to have this with hot rice. Never try amaranth before…but it look delicious! i make this quite often too. amaranth is probably the greens i cook with the most! Thanks Soma for the entry. Amaranth are such tasty greens. The plants look healthy and fresh. I think I’ve had amaranth in the garden before, but I didn’t even know you could eat it….! Looks delicious! I have yet to try Amaranth, the stir-fry sounds delicious! Typical bengali meal sounds sooooo good Soma! i am yet to try my hands on amarnath, dont find it here..looks healthy love the addition of roasted almonds on top! I make this dish with spinach sometimes. But adding nuts in the end is a good idea. Feeding the kids greens + nuts at the same time…hmm…quite a catch! delicious ! I can almost get the fresh flavor of it……lovely ! Soma,the same is cheera in kerala..and the garnish makes me wonder…how thats goin to taste..would love to check this next time..what a yummy make..
and thanks for the typical Bengali food desription..Thats vere relevant I believe Soma…nutritious full meal..At a time people were not that keen on propogating healthy food,unknowingly they had the tradition of a complete meal..thats it..wonderful..inspiring. 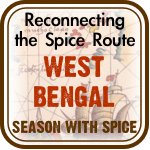 I love Bengali Complete meal menu, that was a nice description …got me drooling !! Shaakh really has a different place in Bong recipes. I just cant count the number of different herbs mom cooks. But this one is really different, shaakh with almonds…. need to try this out. I had never heard of this leaf. Any idea whats this called in Kannada? Anyways, the curry looks delicious and loved the almond topping. I’ve never heard of amaranth leaves, wonder how they taste like. Wonderful textures and flavours though. Like I saw on facebook page, the green leaf ones look like Indonesian spinach. We cook this in soup rather than stir fry. 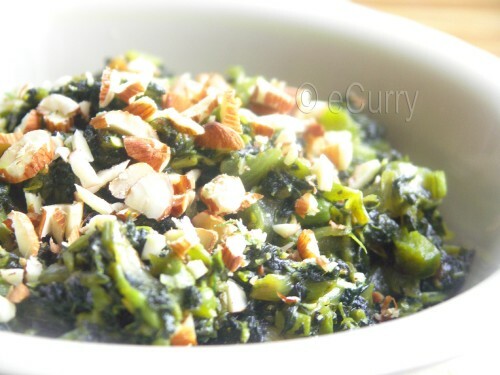 I do cook wilted spinach (English type) with lemon and sprinkled with toast pinenuts sometimes. Lovely to see a different way to use spinach. 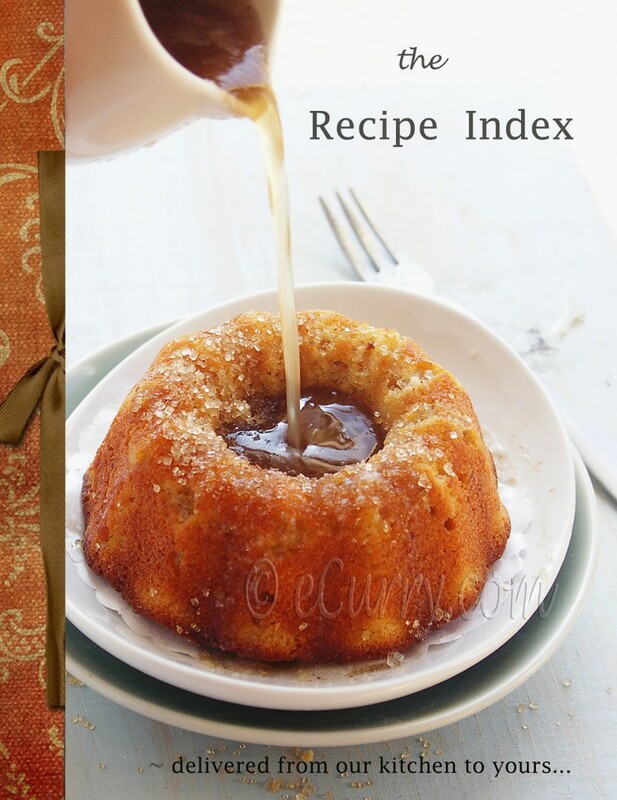 Hi, trying this right now…just making sure, you don’t need to add extra water to this dish? (as per “until the water is absorbed” instruction. Thanks! No no extra water is needed. it releases a lot of water, + if you cover it the steam will be retained inside. I never had amaranth before! Looks good. Soma, you have a green thumb indeed! 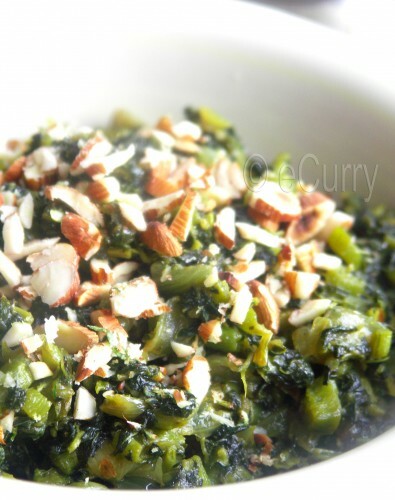 I love greens stir fry and like that almond topping. Saw Ramya’s comment: It is called “Dantina soppu” in Kannada. Thanks a lot soma and red chillies for finding out the name in Kannada. I’m glad you tried. This sounds fantastic, and it’s a great use of amaranth! I tried planting some in my garden this year, but it didn’t survive the heat and drought. I’ll try again though. How did you plant it, Did you just get seeds from the nursery? Help! What a great idea! Dear Soma, I havent seen green amaranth leaf here.. I miss it 🙂 Love the way you explained about the bengali meal course. I like the almond crunch twist to the stir fry. You love almonds, don’t you? LOLl You got it right girl! There are certain things in the kitchen i cannot do without, almond being one of them! Healthy and yummy!I have not had amaranth I think but it looks so good I’ll look out for it. Soma, I have been marveling at your photos. The shak bhaja sounds great! ok,says “…till the water is absorbed.” What water? You do not call for any water. Also, a few hints on time in your receipe would be most helpful. “Let it be cookoed until done” is not helpful, as I have no idea what “done” would look like for something I have never cooked before. No I have not added any water, however just as in most greens (say like spinach), this green will release water of its own, esp. when covered and the steam stays inside the pan too. I should not assume that it would be understood. Sorry about that! Until done would mean, until the greens are tender and cooked through just like you would do to spinach or any green leafy vegetable. It is supposed to be dry dish, but well cooked with soft and tender greens. I hope it all makes sense. Great post! I have a doubt though . I’m growing amaranth at home and I hv the purple variety but the leaves are slowly turning green. Should I wait till its fully green or is it ok to harvest now? I think the color depends on the variety and has nothing to do with the harvest time. Harvesting them young will give you tender leaves. Just do not let stem and the leaves become tough. In Mexico we see the seeds of amaranth, usually in candies or breakfast cereals. I will have to seek the leaves or grow the plant myself. It looks like a near perfect food, especially for vegetarians.